The One City Pavilion is a permanent outdoor feature to a vibrant urban community known as oneC1TY. Located in Nashville TN, the LEED neighborhood development serves as acenter of technology-enabled commercial, residential and research activity. Nestled within the development, The One City Pavilion stands at the center of a green community lawn. 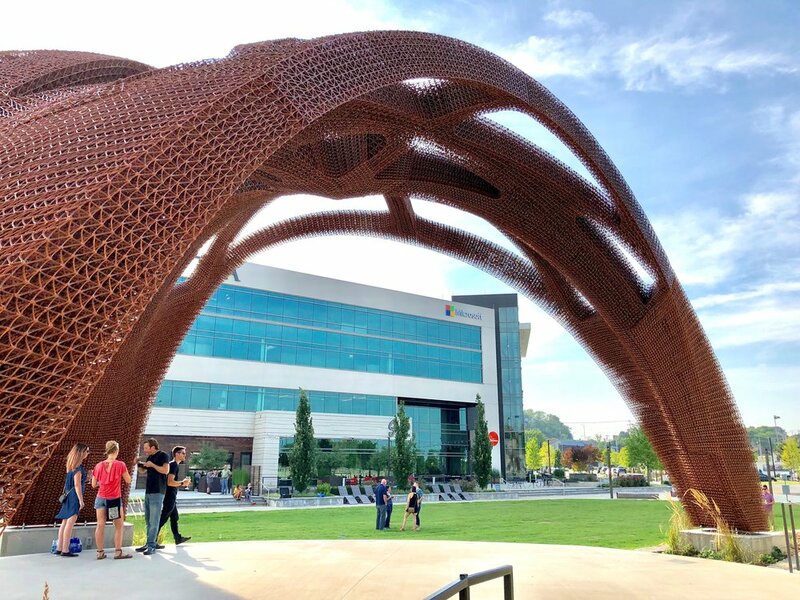 At 21 feet tall, it is America’s tallest 3D printed structure. It is carefully embedded within lush planter beds and ascends to span as far as 40 feet - also notable as the world’s longest spanning 3D printed structure. It reaches over an elevated performance stage while pathways below meander through it to adjacent leisure spaces. The warm copper sparkle of the pavilion ties into Ipe wood steps below, contrasting blue skies above and the glistening of adjacent water features. 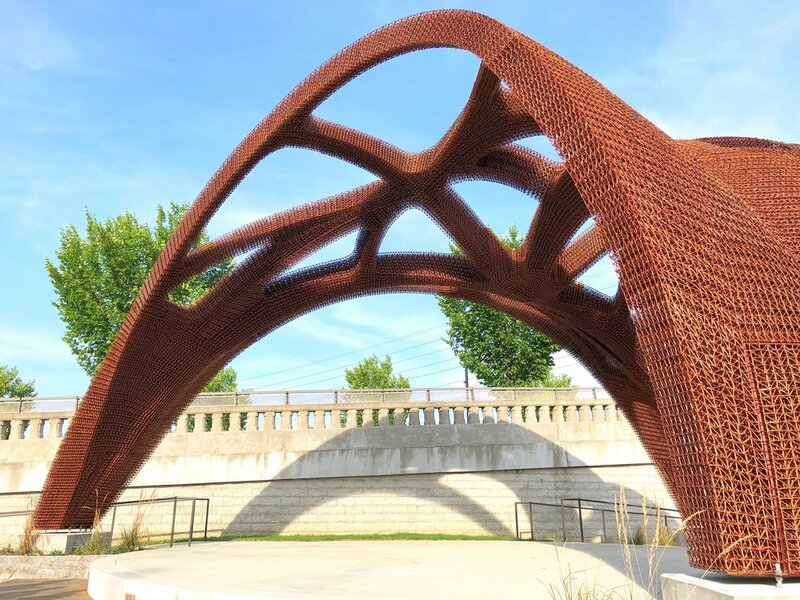 Rich with experimentation and innovation, the design of the pavilion is realized as a 3D printed shell structure leveraged by Branch Technology’s unique large-scale 3D printing process, C-Fab (Cellular Fabrication). It represents an intersection of technology, engineering and design. 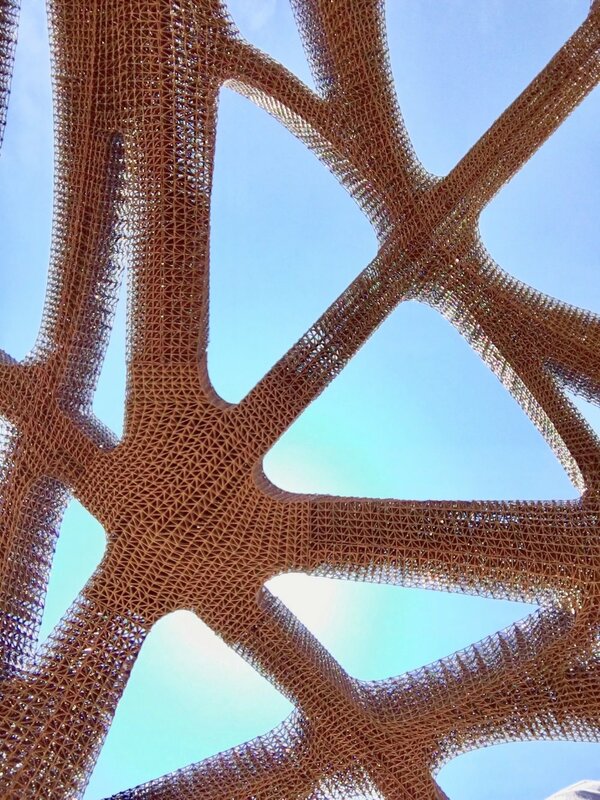 Because 3D printing enables virtually and shape or form to by mass-customized, the geometry is freely manipulated to create a strong form where needed. Three thickened legs anchor to elevated concrete piers where thrust forces vary and compressive forces are greatest. Voids are carefully carved into the vaulting surfaces above where uplift forces are elevated. The Pavilion also balances a confluence of manufacturing, transportation and construction. Based on the forces flowing within the 1000cuft spanning structure, the geometry is broken down into just 36 colossal parts. With 7 axis of freedom enabled by Branch’s industrial robotics each part is unique, complex and unprecedented. They weigh as much as 175lbs and extend as far as 18’ in length. After printing completion parts were shipped to job site and fit together like a 3D dimensional puzzle. Complex design concepts, engineering validation processes and manufacturing abilitiessuch as this have been long established in the digital realm. Now and with Branch Technology’s 3D printing method, ideas and dreams become built reality.